Cook the beans, broth, peppers, thyme, and garlic in the chicken broth for about 20 minutes, until the beans are soft. (Unfortunately, the brilliant color goes away and the beans turn gray at this point.) Cool, then puree the mixture in the food processor with the other ingredients. If you're smart, you'll blend up the tomatoes and walnuts first, but they worked out okay added in later. 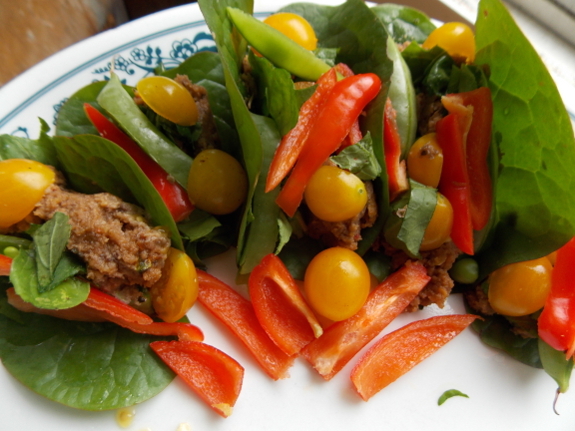 Serving suggestion: Make little tacos out of Malabar spinach leaves filled with bean paste, chopped arugula, and thinly sliced tomatoes, red peppers, and edible-pod peas. These can be eaten with one hand like a soft taco if you're careful not to overfill. While this serving method is a bit time-consuming to prepare, it's pretty and fun for a special occasion! Happy birthday, farm! 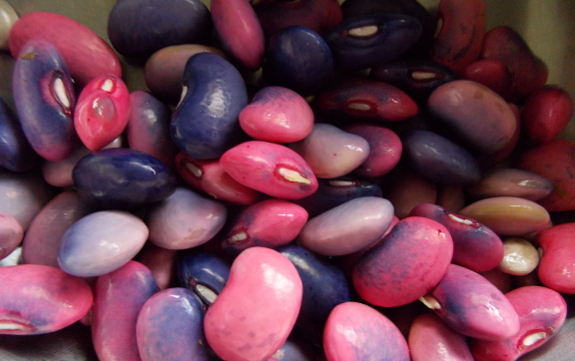 we tried scarlet runner beans this year, the pods took forever to shell and we had to get them started with a knife (cutting off one edge to open the pod) over an hours worth of work for 1/2 cup of beans. how do you shell scarlet runners, they had some of the thickest pods i have ever seen. Rebecca --- I'll admit that I only shelled a cup, and did it on a weekend when I had plenty of time to play (and didn't time myself, although I think it took less than half an hour). I shelled them by hand, just broke off the ends to get started on opening as necessary. 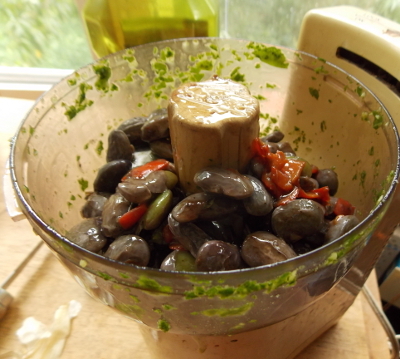 I'll probably save the rest of the beans to dry, which will probably make them much easier to shell.